ITS HERE! ITS FINALLY HERE!!! I DID IT!!!!! The Fuse & Ms Fire Files! Im actually a classic gaming fan and found out that First Star software, the original creators from the original game back in 1984, made a remake but only for IOS systems. They said longer ago they "would" make a port to PC but i actually asked them viva email and they said, they never even began to work on a port for PC or like. Sad about, i thought about i should give it a try myself and "re"create somewhat the original game. So...i did. Its not a full 1:1 copy BUT it comes pretty close to it! SAID HERE: This is a 2 PLAYER LOCAL GAME ONLY!!! 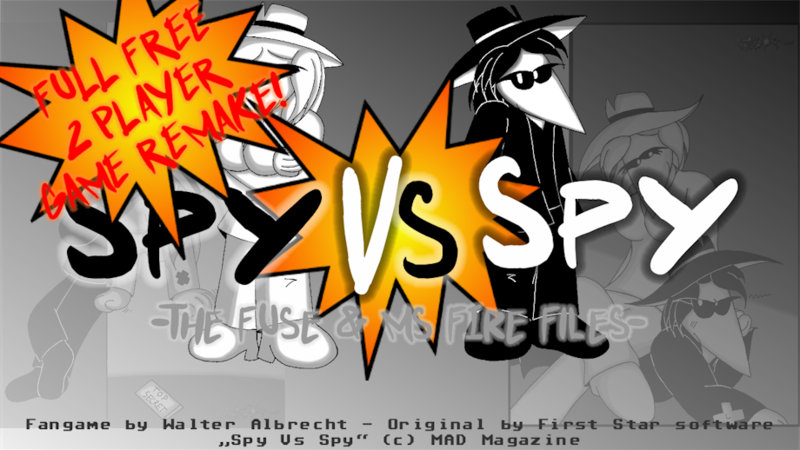 I tried to came "as close as i can get" to the original Spy Vs Spy game from 1984. I made some stuff easier since i also used the GBC version from Spy Vs Spy as influence. So what you got in this game? -Play As FUSE or MS FIRE! --The briefcase to store them & keep them all! -good music & funny sound effects! Check your files' access on Dropbox. I keep getting a white blank page when trying to download them. Make sure its public. Sounds promising, and from me that is a compliment - I was on the C64 Team for writing the original 2 games on First Star. I also did many of their other games. Sorry, I can not give out permission for the copyright, especially for this game. FSS was bought out by Atari in the early 90s and the copyright is now theirs shared with Mad Magazine. Check your files' access on Dropbox. I keep getting a white blank page when trying to download them. And you were??? Oo gees thats nice XD i mean i LOVED the original games back in the 80s! And yea, i know its copyrighted but again, its a freeware game and a fangame, not a 1:1 remake (i even said that all in the game and what not). I like what you did. You should port it over iPhone/Android,or at least a mini-version free-ware (like this one) with a lesser rooms and see who will knock on your door. This could mean a lot of money for you. If you take it to this level, do like you did here - state that this is a fan made game based on the original game and give credit to First Star Software and Mad Magazine for their idea and copyright. Doing this will protect you, and you will be contacted by Mad Magazine. The worst that can happen is that they tell you to take down the game. The best they can do is want to talk to you about making new games and pay you for it. First Star Software was created by 1 person, my name sake Fernando Herrera (we share the same name, it is a strange coincidence that it happened that way.) He expanded the company and in that expansion I was hired to program the Commodore Vic20 and C64. The same can happen to you. The code to this game you created is your copyrighted work. You can switch characters and turn it into something else. You can change the characters a bit (like you did with the White Spy by making it female) and give it a new name like "Spy Wars." If people like it, they will buy it. If it is free on iPhone and Android, you can have a branch for the PC version which they can buy. Both Android and Apple pay developers for apps like these when they become popular. I have not programmed in years! But I'm glad that somebody out there did do something with Spy vs. Spy. Do not think that "being a nobody" is a bad thing. Everyone has to start somewhere, and this I like a lot, it is a great step for you. I hope you think about it and take it. But yea, i will see, maybe if it gets more attention i will do something like that OR MAD really DO contact me (or FSS) and they "want" something from me. But yea, again, i stay save at least for now, Since i used my OC Spy characters maybe but the game comes close (to the art and wise) of the original game and, again, i dont wanna get into trouble. The only proof, if any is in the game Bristles, and only in the Original C64 version and not in the Atari Rerelease of the game. Somewhere in all that 32K of Code is the letters "ELF" - which is the initials I use in arcade high scores. The other is in the how the game loads, which if you were a Commodore C64 owner back then, was scary sounding. I hand laid out the file sectors on the floppy disk as if it was formatting the drive. I did this as an "Anti-piracy" technique; loading the game in this fashion took a certain amount of time and if one just file copied the disk, it would load faster, and then the time check would come up short and then not run the game. Sector copying the floppy disk was only 50% effective, as every time one formats a disk, the layout was always slightly off. FFS had these Analog Disk copiers which copied the floppy disks perfectly. When Atari acquired FSS in the late 80s (under Jack Tremiel), a lot of the games were released without the anti-piracy codes and hidden things; putting in his own protection in their place. It was at this time when I left First Star Software - the C64 run was dying out though it held strong in the PC Market with Apple and Atari into the 90s, even with PCs taking over 90% of the market. But one thing though, under Atari's thumb, games like Spy vs. Spy and Boulder Dash ended up with an arcade version, which First Star Software did not have at the time. :D That was my creation! Well, "ours" - the two Fernando's, he on Atari and I on C64. It was originally done on the Vic20 but technical limitations of the Vic Chip I did not allowed it to happen (No sprite support on the Vic20) But on the C64 and its Vic Chip II, it was great! Originally, the "boy" who puts his hand on the wall was supposed to be a girl. And there was a magic can opener to deal with the Evil Paint Can, but some thought it was too violent and it was removed. I played the game, but I was only one player. It was great but it needs a little work. It does hold a lot of promise. My biggest issue it the screen size. There are routines to you can download that will adjust the game for what screen size it is played on and the game will vastly improve from there. Not just for PCs, but when you take this to Android and iPhone, your program will need to know what screen size it is on and adjust itself accordingly. glad you like it so far but yea, i duno if Clickteam fusion 3.5 dev. version is able to change the screensize. i "tried" to make a splitscreen, what im sadly not able to, if i would (or more, the program) it would change a whole lot - mainly the screensize and sprites for sure.